"I'd follow Wren Ross anywhere she goes!" "Wren Ross is one of the best kept secrets ... revolutionary!" "I am so proud of my great, great, great, great, great, grandaughter! If I heard this CD years ago, the flag would have a completely different texture." And She Loves to Write and Sing About Knitting!! 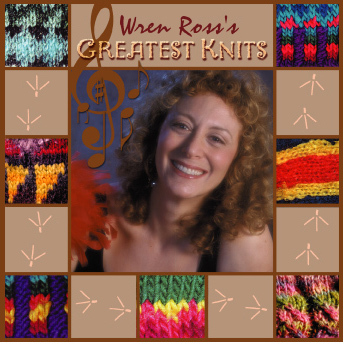 Come hear Wren sing songs from her "Greatest Knits!" CD. A bluesy "Ba Ba Blacksheep", 76 Stitches On a Number 10" and more!!!! Also!!!! Look for Wren's sweaters and articles in upcoming issues of Ultimate Knitting Magazine and the soon to be released "KnitLit Too: From Sheep to Shawl"! 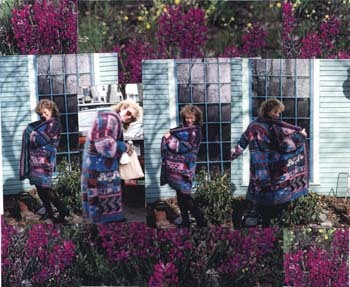 Wren wrote a piece called "Tangles" which was included in a new book published by Random House called "KnitLit: Sweaters and Their Stories ...and Other Writings About Knitting"
Click here to read an article from The Sunday Journal about KnitLit and Wren Ross. New!!! Read what best selling author Cheryl Richardson (Take Time For Your Life, Life Make Overs) says about Wren's knitting wisdom! Click here to read about Wren's latest fiber arts class! More to be announced ..."cast on" to Wren's website for future notices! Copyright © 2002 Wren Ross. All rights reserved.